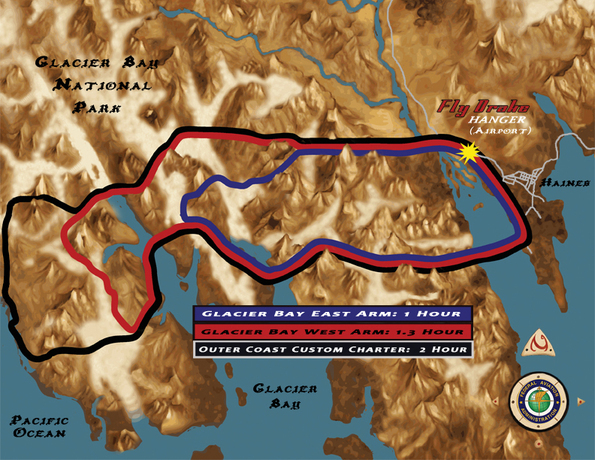 Haines Alaska is on the Northern Door step of Glacier Bay National Park. Review my group rates below and you will find they are the best deal! Click Here for Skagway Departures! The perspective I bring to the flightseeing experience is from the adventures angle. Years of mountaineering, skiing and flying in Glacier Bay have given me an edge over my competition and this is from the ground up. To be honest a bush pilot with a past competitive racing career has a unique demeanor. One of which takes time, concentration and devotion to life and the structural integrity of each of my planes. Every day brings a new adventure in which I absolutely enjoy sharing. As a sound pilot you can step in my plane glance through the clean windows and hear clear sound through each passengers headset enjoying every moment of our flight ahead. Being in tune with my surroundings and the love of life allows me to fulfill my greatest intention of coming home to my daughter Tiaya at each days end. Remote glacier/beach landing offered at $25/person. Call me (907) 314-0675 or use our contact form to learn more.